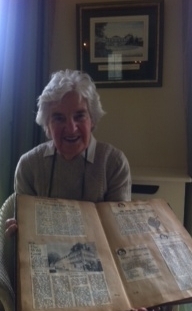 I was delighted to be shown an article today, by Mrs.Allen, from one of her ‘Scraps and Cuttings’ books, all about her weekly cookery column in The Farmers Journal. 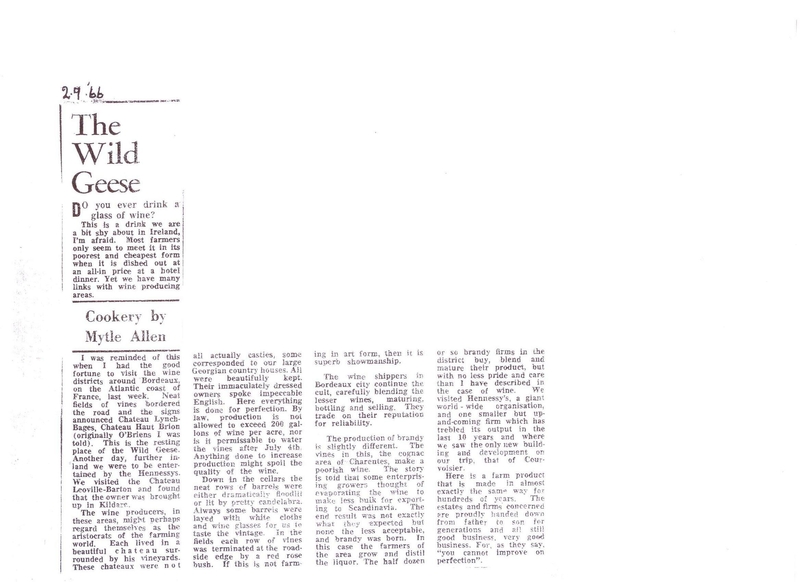 The article, dated in Mrs.Allen’s distinct neat writing, 2nd September 1966, titled ‘The Wild Geese’, about Ireland’s ‘links with wine producing areas’, and her visit, in 1966, to Chateau Leoville-Barton, and also mentioning Chateau Lynch-Bages and Chateau Haut Brion, and her visit also to Hennessy Cognac. Also of great Wine Geese interest, is The International Wine Museum, in Desmond Castle, Kinsale dedicated to the Irish people the world over, both long ago, and current generations, involved in winemaking around the word, is well worth a visit, and of course Ted Murphy’s book, A Kingdom of Wine, The Story of Ireland’s Wine Geese, is brilliant, and this years series of wine geese events that I am involved along with, along with Beverley Mathews, of L’Attitude51, Wine Cafe, Cork and Maurice O’Mahony, of Wine Alliance, and the broader vibrant wine commuity of Cork city and county, is very much inspired by Ted and all his things ‘Wine Geese’ related in Ireland and around the world.